In three diverse locations in Australia, a new Indigenous education program conceived in the US is achieving unprecedented success in engaging mothers of Indigenous newborns. 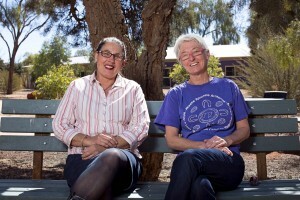 Quest travelled to central Australia to meet program worker, Carmel Barry and participant, Sylvia Drover. Sylvia arrives to tell her story at the Old Telegraph Station on the parched red banks of the Todd River, Alice Springs with one-year-old Marika, her cherubic fourth daughter, on her hip. Sprawled on a picnic rug in the bright winter sun, the baby does not give her a moment’s peace, but her scrambling interruptions are fitting, as Marika is the key to her mother’s learning. Sylvia is one of the first round of participants of an intensive mothers’ education program based on a model that has been highly successful in the US for over thirty years. The Australian Nurse-Family Partnerships Program (or FPP, as it is locally known) is run by Central Australian Aboriginal Congress and provides two years of home-based education for mothers of Indigenous babies. Women enrol when they are three months pregnant and are visited fortnightly by a dedicated nurse-educator until they graduate when their child turns two. The FPP differs from other home-visit programs in that it is primarily focused on the mother rather than the baby. Sylvia was paired with program worker, Elise, eighteen months ago. “Elise takes all the things to do. Pictures, photos, activities—all part of the learning,” says Sylvia. The Environmental Health domain encompasses safety in the home and housing needs. “Most women that I visit don’t have their own home, so it’s like Maslow’s triangle of needs,” says Carmel, “there’s no point talking about caring for the baby if they don’t have a house, and the same with their study desires.” Where the home environment is not conducive to learning, nurses often drive the women to local parks or cafes for sessions. The Maternal Roles domain talks about baby’s needs and development, which teases out into playing and floor time. The fourth domain is Life Course Development, including baby spacing, managing fertility and accessing courses or study. Again, the nurses begin with basic questions; “How many children do you want to have? Do you have a desire to finish any education or start a course? And that process is really amazing. Women are telling us that they do want to study,” explains Carmel. Part of the nurses’ role is to be aware of further learning opportunities available in the community, but this has presented some challenges in Alice Springs. The strong network of community colleges and neighbourhood houses that exists in several other states is not as established in the Northern Territory. This narrows referral options for workers such as Carmel. In Alice Springs, community education is largely provided by bigger institution such as Bachelor College. The last two learning domains are Family and Friends, which is about relationships and Health and Human Services which links families into what’s available in the area, such as libraries, local transport etc. In America, the program is called the Nurse Family Partnership Program and was developed by David Olds. After thirty years of longitudinal research, it has been shown to produce dramatic affects including improved prenatal health, fewer childhood injuries, fewer subsequent pregnancies, increased intervals between births, increased maternal employment and improved school readiness. Follow-up research continues today, studying the long-term outcomes for mothers and children in three separate ongoing trials. Although the workers on the program are nurses, not educators, there is no clinical component to the visits. They are there purely to facilitate learning. “Elise changed my life,” says Sylvia.